At the beginning of this year I set out to build myself a HTPC to satisfy my newly emerged want for games and also serve as media playback machine, i.e. Blu Ray, DVD and everything I have on iTunes. Accompanying the PC (yes, it was a PC not a Mac) was a Samsung 40″ TV. Following are my – then anounced and long-in-the-waiting – experiences using this combo for gaming and watching movies – and even reading comics. About the gaming performance: I had no doubt about that, never! I have carefully chosen components that are considered to be high performance. Following are only a few comments about some of them as all of those parts have been reviewed in great detail by many hardware sites. The graphics card was one of the great unknown in case of noise. I’ve read back then that this card has a powerful cooling system that can be throttled without any worry about high temperatures. My experiences paint a different image. In demanding games like Dirt 3 the graphics processor heats up very quickly. There’s no other way to counter that but increasing fan speeds. Luckily I found the MSI Afterburner tool which has a nice fan control with custom thresholds based on the temperature. It also seems to work with any recent AMD based video card. This allowes me to keep the card quiet on the desktop and (relatively) cool when making it crunch numbers. Heat dissipation is very game dependent and compared to Dirt 3, for example, Borderlands doesn’t present much of a problem. The wireless keybord has a very big range until connection problems surface, much unlike the mouse. One to two meters, better one, and it’ll work. Apart from that I am very content. SSD is king, that must suffice. All in all, I am very happy with the PC as a gaming machine! 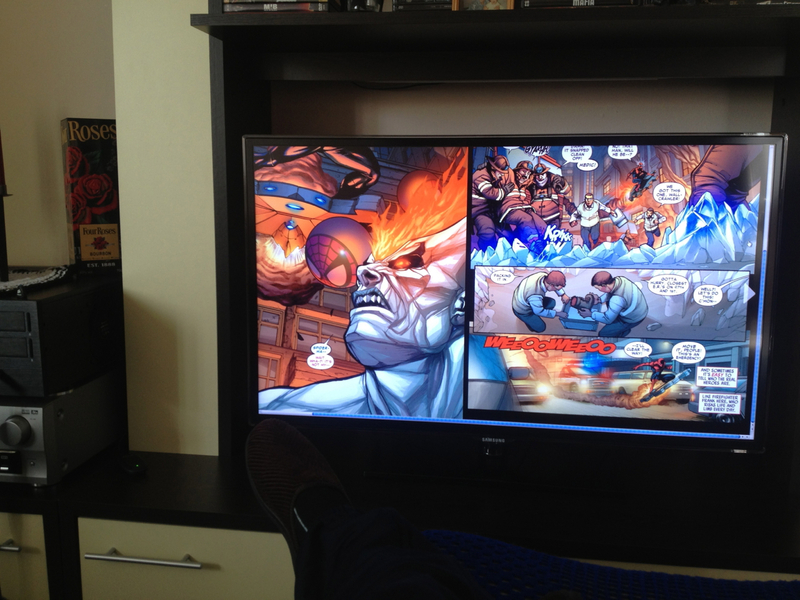 The impressive thing, compared to a PC monitor, was the size of the image: 40“ vs 23” is a very obvious difference. The first look makes your jaw drop but after some time you can see the little annoyances creep up. Though the screen was a lot bigger it was still too small or my couch was too far away for gaming. Any shooter or RPG loses many of the details of the visuals and content just because of the distance to the screen. Dirt 3 is a little bit of an exception and actually tolerable from the couch. Maybe this was because of the many different bright colors this game uses compared to Diablo 3 or Borderlands. For those games I had to move furniture to sit closer. Which brings me directly to the next point: Image quality. It isn’t even near an average PC monitor. This may very likely be due to the fact I was only willing to spend around 500 € for the TV but the colors are just bad if you’re used to an IPS panel. They are by no means vivid and by far too few. To add further insult to injury, the pixels appear huge when sitting at a distance good enough for playing (which is natural once you get closer to any screen, I know). In combination this made it hard to emerse myself in most of the games. Next up is the response time of the display. I could have lived with that, since it is very dependent on the game, but in combination with the image quality this really left a bad after-taste while playing. Especially in shooters you can see smears on hard edges (e.g. corners of a house) when moving around. Borderlands with its limited color palette showed very ugly artifacts. It was playable after all, but not too appealing. Last but not least: Illumination uniformity. Dark images show halation in all four corners of the screen. Since I’m not playing Doom 3 all the time (where it’s either black or shooting a gun) this is no big deal but it can be seen once in a while. Unfortunately, I have no photo equipment to capture this effect. When playing games I felt like I was missing out on something. However, I’m pretty happy with the TV being a TV. Watching movies from the couch is very entertaining (compared to the chair in front of a monitor that I was used to all those years) and doesn’t show any of the bad characteristics that I experienced during game sessions. Especially Full HD movies look very good! At one point I even read a Spider Man comic on the TV. Nerdy cool! Apart from gaming, the TV does a good job and I actually don’t regret buying it, even if it doesn’t serve its originally intended purpose any more. It even plays back MKV videos from an USB stick. Only the remote’s buttons are crappy. You have to push them hard and need to focus on pushing them straight down, the whole thing, not just one corner. Crappy! One short note on the optical audio out of the TV. When using it to pass the audio from the HDMI cable to the amp not all of the audio signal was transmitted when playing a DVD or Blu Ray. I noticed that while watching Serenity and finally got very suspicious when, at the end, in that big space fight, there was nothing but utter boredom. Once I connected the optical out of the mainboard to the amp I was blown away by 3D audio effects and all of a sudden that scene and everything else of the movie gathered momentum. Now, what are the consequences? For one, I moved the hardware from the cool hi-fi like case into a spare standard midi tower and bought myself an Eizo Foris FS2333 BK gaming monitor (review on a renown german LCD monitor review site). And just like that, I am able to see the details that I was missing on the TV. Though Dirt 3 was tolerable it is waaaaay better on the monitor. All of a sudden my driving improved just because I’m able to see the road farther ahead. The image is crisp and clear and the colors are just awesome. There’s no beating an IPS panel in that regard. It is also fast enough to enjoy Borderlands or any other fast game without any glitches. I highly recommend that piece of hardware! That means that I am officially back on playing on a desktop computer, something I tried to avoid but which evidently seems to be the best way for me to celebrate the nerdy art of gaming. What about the now spare hi-fi case? That’ll stay put right on top of the amp and become a true HTPC without gaming capabilities. More on that in a future post. The hardware has already been ordered and shipped, only the assembling still needs to be done.